Facing south west, the setting sun invites itself into the cabin late in the evening, a friendly terrace allows you to enjoy the very last rays of the sun. Its typical « trapper’s cabin » design will transport you to a Canadian atmosphere. 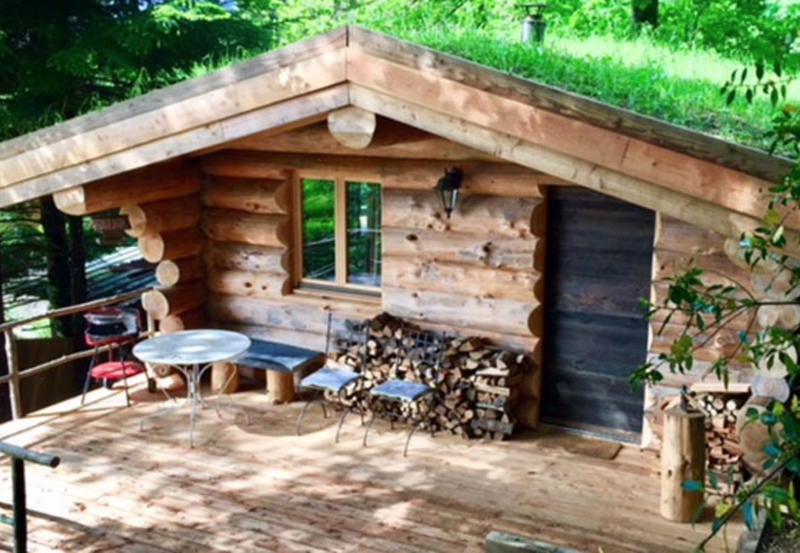 The 13-tree cabin is built of logs with a green roof. Watching the flower-covered roof is a spectacle in itself. It’s ideally located for children to play in the forest. It is accessed by a stone staircase that leads you to its terrace where everything is provided for relaxation. The 13 tree house can accommodate up to 4 people. Unlike the other 2 chalets, there is a closed room, equipped with 2 single beds that can be combined as well as a sofa bed. You can prepare your meals in the fitted kitchen and enjoy them either on the terrace or inside on the shepherd’s table. There is a bathroom / WC with a « barrel » shower that will delight young and old alike! In addition to a reversible « air/air » heat pump, you will find a wood stove to enjoy your evenings by the fire. Veuillez renseigner le formulaire ci-dessous pour contacter le propriétaire.